St. Peter's Anglican School holds a carnival-type fair in the end of February every year. It raises money for the school. 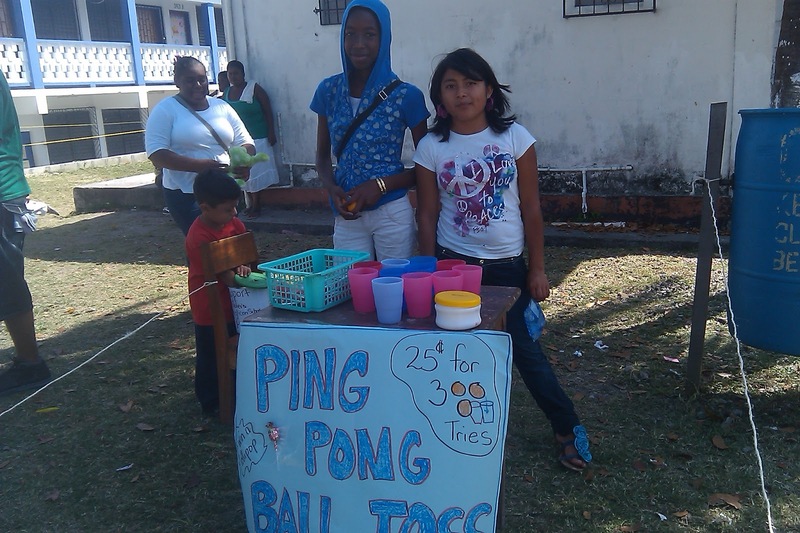 Each class sets up some booths from which they sell food or have games children can play. About 3 days prior to the fair, I took the Deaf class to the garden and we transplanted some of the smaller plants into pots to sell. 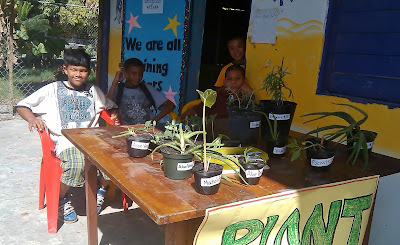 We sold rosemary, aloe vera, macolito (a soft potato-like vegetable plant), mint, epezote (a medicinal plant used to rid people of worms), a yellow iris flower, cilantro, cucumber seedlings, and zinnia seeds. It's time to get the St. Peter's Anglican Seed Company up and running again because we sold all but 4 of the seed packets. In the picture below three of the Deaf boys are manning the PLANT table. They are squinting because it was a beautiful day with lots of sun. The temperature was about 90. Misael, on the left is my garden protege. He is always ready to help and seems to intuitively know how to do many things. When we transplanted the seedlings he knew to put the plant in the pot and sprinkle the soil around it, rather than push the seedling into a small hole. Sulmi's regular ed Standard 5 (7th grade) class had several booths. I offered to set up a ball toss for Mr. Valdez' class. Two of the girls from the class manned it. They did a great job!!! I kept asking if they wanted to be relieved, and they said, "No, we like this." They earned $26 for the school. Every little bit helps toward the goal of each class earning $400. Mr. Valdez' big money earner was a pony ride. :-) He had two horses at a dollar a ride. Many of the children had never ridden on a horse before. Everything went smoothly. I thank God for a good day.